Sunday, May 13 from 9:30 a.m. until 4:00 p.m. 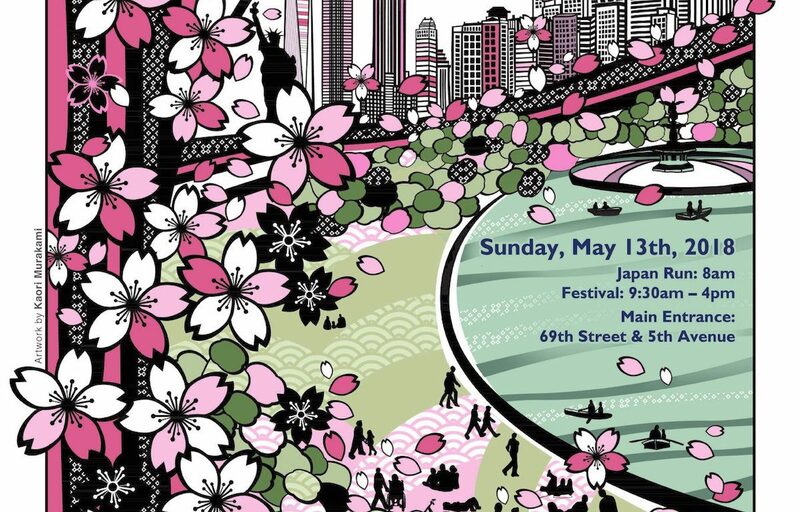 The 12th Annual Japan Day @ Central Park is bringing Japanese culture to New York this Mother’s Day! It’s a festival that celebrates the diversity of Japanese culture through food, activities, and performances and has something for everyone of all ages. The event kicks off at 8:00 a.m. with the rousing four-mile Japan Run followed by a Kids’ Race, hosted by New York Road Runners. Registration is already at capacity, but you can cheer on the participating runners! Throughout the day the Japan Day Festival features a wide range of Japanese traditional and family-friendly activities, free samplings of popular Japanese cuisine, and powerful stage performances. Various Japanese-run businesses and Japanese community organizations will host the eleven activities booths. Take a bullet train ride with the East Japan Railway Company, write in Japanese at the calligraphy booth hosted by the Japanese American Association of New York, have your picture taken with Hello Kitty courtesy of Sanrio, take more pictures at FUJIFILM North America Corporation’s Instax Photo Booth, have your face painted like your favorite Kabuki character by Northeast Council of Teachers of Japanese, watch Central Japan Railway Company’s new video of the latest Super Conducting Maglev train, craft origami with the Origami Therapy Association, learn how to play shogi and go with the New York Shogi Club / Brooklyn GO Club, fish for a “Yo-Yo balloon” at the JETAANY and Japan Society booth, try on Yukata with the help of NY de Volunteer, and raise your awareness of breast and cervical cancers at the Women’s Health booth sponsored by BCnetwork. Five food tents will serve your favorite snacks and Japanese comfort food, including gyoza (Ajinomoto Foods North America, Inc.), okonomiyaki (Otafuku Foods, Inc.), onigiri (TABLE FOR TWO USA and ITOCHU International Inc.), Hello Panda chocolate samples (Meiji America Inc.), shrimp chips (TABLE FOR TWO USA and Calbee), and tea (ITO EN North America Inc.). Japan Day @ Central Park organizers welcome Kana Uemura and Puffy AmiYumi, two exceptional musical acts who have been very prominent in the Japanese music scene. Puffy AmiYumi will celebrate the 22nd anniversary of their debut! Founded in 2007, Japan Day @ Central Park is an annual event designed by the Japanese community of New York to promote a deeper understanding of the Japanese culture and to say “Thank you, New York!” It has received official support by the Office of the Mayor, the New York City Department of Parks & Recreation, the Central Park Conservancy, New York Road Runners, the Consulate General of Japan in New York, the Japanese Chamber of Commerce and Industry, Nippon Club, and many other Japanese and American corporations. Last year, a total of 55,000 visitors enjoyed a full day of Japanese culture.